Lisa E Design Blog: Cupcake, anyone? Oh, to have something sweet! This was one of our card class cards for July. 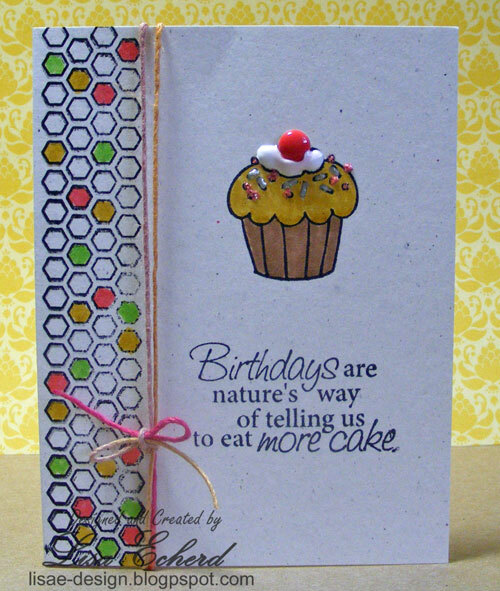 The stamp set is an old one from Hampton Arts though you could use any cupcake set. The border is from Interlocking Borders by Lawn Fawn (on-sale right now along with everything else in the store at Two Peas in a Bucket). Stickles and liquid pearls form the 'sprinkles.' I used an enamel dot for the cherry on top. The whipped cream is white fabric paint which look almost real! Thanks for stopping by! I have a surprise coming in a few days, hopefully by the weekend. Very cute card! Love that saying. Very cute. 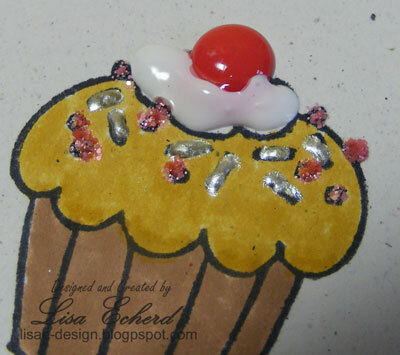 I especially love the enamel dot "cherry" and the fabric paint whip cream. Yum! Yum! I love how you created the frosting, sprinkles and cherry on top! Really cute card! Love cupcakes!